“Up until near my twentieth year I always ate puris,” Srila Prabhupada once related when he was traveling with one of his disciples. He had just finished his packed lunch and was relaxing as he spoke. “I had no taste for capatis [flat breads] and on principle would not even eat them. It was awkward to go to a friend’s home and not eat if they were served. But somehow I never would have to eat them.” He laughed remembering this story. Fresh puris—deep-fried puffed breads with thin, crispy, light-brown crusts-are among the finest breads in the world. Their wholesome taste and high nutrition value derive largely from the purity of the ingredients and the simplicity with which they’re made. They are best when served still warm from cooking. Puris are appropriate for all sorts of meals. Because they’re deep-fried, they keep well, which makes them ideal on picnics or when you’re traveling. Their delicious flavor makes them ideal for festive occasions like parties, special dinners, and weddings. You can have them in the morning with jam or halava, in the afternoon with soup and vegetables, or in the evening with milk, as Srila Prabhupada and his father did. Traditionally, puris are made from golden wheat that has been stone ground into a fine, beige-colored flour called atta. Since atta is whole wheat, it’s a good source of natural fiber. Also present in atta is the nut-flavored wheat germ, high in protein, iron, and vitamins B and E. And, of course, atta contains the endosperm, which constitutes the bulk of the wheat grain and is rich in complex proteins. (When these proteins are moistened they form the elasticlike gluten that allows puff dough to be kneaded and shaped.) Almost all Indian grocery stores carry atta, but if it’s difficult for you to get, try using the whole-wheat flour, bread flour, or whole-wheat pastry flour that’s available in supermarkets and healthfood or gourmet stores. For best results, coarsely ground flours should be sieved to remove large flakes of bran. (These can be saved for other dishes.) You’ll find that the fine flour that results from sieving yields a smooth dough that responds readily to kneading and rolling out. If the puris you make aren’t perfect the first time, don’t be disheartened. They’ll be delicious anyway, and your ability to make them will improve with patient practice. Keep in mind that the consistency of the dough, your technique for rolling the dough, and the temperature of the frying ghee or oil must all be correct. 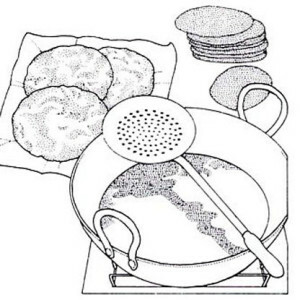 There is another factor for successfully cooking puris, one that is on a higher platform and is really the point of Lord Krsna’s cuisine: to spiritualize our consciousness. We can do this by cooking puris (or any other vegetarian dish) with Krsna in mind and by offering the food to Krsna with love and devotion. Since that which is connected to Krsna becomes of the same spiritual nature as Krsna Himself, not only do the cook and the food become spiritualized, but those who eat that Krsna prasadam, or spiritual food, also become spiritualized, Krsna-ized. 1. Sift the two flours and the salt into a mixing bowl and rub in the tablespoon of butter (or ghee) with your fingertips. Slowly add the water, and mix until all the flour sticks together and you can knead it. Put a little ghee on your hands and knead the dough for 5 to 8 minutes until it is smooth and firm. 2. In a wok, or saucepan, heat the ghee or oil over a medium-high flame. Meanwhile, smear a few drops of ghee on the rolling surface. Don’t use flour—it burns and discolors the ghee. Shape the dough into 16 patties, and roll them out thin and even. 3. When the ghee begins to smoke, lower the flame to medium. Lay a puri on the surface of the ghee, being careful not to burn your fingers. The puri will sink for a second, then rise to the surface and sputter. Immediately submerge it with soft swift pushes, using the back of a slotted spoon, until it inflates like a balloon. 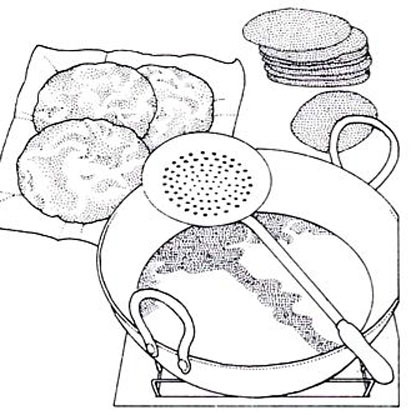 Fry the other side for a few seconds; then remove the puri from the ghee and stand it on edge in a colander to drain. (When your skill increases, try frying several puris at a time). Cook all the puris the same way. 4. 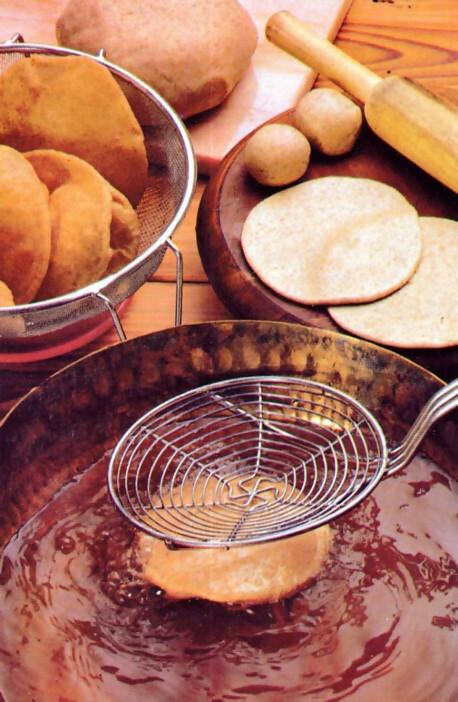 Offer the hot puris to Krsna with any meal or as a snack with applesauce, honey, jam, or fresh cheese. 1. Sift the two flours into a large mixing bowl and add the spices and salt. Dribble the melted ghee or butter over the top, and rub into the flour until the flour resembles coarse bread crumbs. 2. In another bowl, mash the bananas into a smooth paste. Stir the sugar into the mashed bananas, then pour the mixture into the other ingredients, mixing thoroughly so that all the flour sticks together. If more moisture is needed to bind the flour, add more mashed banana or a tablespoon or two of warm water. If the dough is too sticky, add more flour. Knead the dough for several minutes, until it is smooth and fairly firm. Then set it aside. 3. Let the dough stand for 15 to 30 minutes. Then roll and deep-fry the kela puris as in the recipe for puris. Offer to Krsna hot. Commercial yeast is seldom used in Vedic breads. Batter is left in a warm place to ferment. In hot climates, batter will ferment in two hours; in colder climates baking powder is used to speed up the process. 1. Start the night before by mixing together the yogurt, sugar, baking powder, and white flour in a large bowl. Cover the bowl with a cloth, and set it aside in a warm place overnight to allow natural fermentation to take place. The mixture is ready for the next step when bubbles appear on the surface. 2. In another bowl, mix together the atta or sifted whole-wheat flour with the salt, and rub the ghee or butter into it with your fingertips. Into this bowl, add the fermented mixture and the warm water. Work it with your hands until it holds together and forms a dough. Knead the dough for 5 to 10 minutes or until it is silky smooth. Add a little flour if it is too wet. Now gather it into a compact ball, cover it with a damp cloth, and set it aside in a warm place. 3. After 2 hours, knead the dough again. Form it into 15 balls and roll them into 5-inch discs. Heat the ghee and deep-fry the bhaturas exactly as you would puris. 1. Combine the sieved wheat flour, white flour, powdered spices, and salt in a large mixing bowl. Add the ghee and, using your fingertips, rub the ghee into the flour mixture until it reaches the consistency of dry oatmeal. 2. Pour in just under ½ cup of water and mix vigorously, adding enough water to prepare a slightly stiff but pliable dough. Knead with the knuckles or palms, using a little melted ghee, for about 10 minutes, or until the dough is smooth and elastic. Gather the dough into a ball, spread a film of ghee over the surface, place it in a bowl, and drape the surface with a damp cloth. Then allow the dough to rest for ½ to several hours at room temperature. 3. Roll, shape, and fry the puris as directed in the basic Puri recipe on this page. 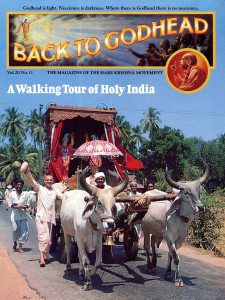 Offer to Krsna hot.